Cutting chicken often requires the proper knife for the job. 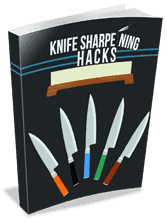 When you use any old knife, you can dull or break the blade, or even cause injury to yourself. On top of all this, your chicken won’t be cut with the precision it deserves. The right knife to cut raw chicken will allow you to cut through bone and provide the right leverage to slice through chicken with ease. You’ll also need the right type of metal with a blade that allows you to remove smaller chicken bones when needed. With the right full tang blade, you won’t have to worry about the blade breaking and causing injury either. Knives are made with a specific purpose in mind, and a boning knife is meant for chopping through chicken safely and with the utmost precision. If you asked me to choose one knife to cut raw chicken with, it would definitely be the Wusthof Classic. This is an exceptional knife from all aspects, and includes a 5-inch boning blade that is perfect for removing bone from cuts and trimming excess fat off for the perfect cut of chicken each and every time. The secret lies with the precision-forged blade that is made from high-carbon stainless steel. German craftsmanship, this blade is light yet durable and allows for just the right flexibility to remove hard-to-reach bones from inside a chicken breast. Plus, the blade has been laser cut with a tested cutting edge to ensure that it can slice through chicken without excess force needed. It’s the perfect knife for cutting chicken, and I’m sure you’ll love it just as much as I do. I’ve been using this very knife since 2011, and it’s just as impressive today as the first time I used it to cut chicken. There is a lot to love about this knife, and I want to point out a few features and prime points that allows this knife to excel at cutting chicken. The blade is 5 inches in length, which makes it long enough to allow for a safe cutting distances yet short enough to allow for a highly durable blade. Weighing just one pound, the knife’s weight is mostly seen in the blade handle. Featuring a full tang and three-riveted handle, you’ll never have to worry about the blade detaching from the handle itself. For me, this is a must-have because a breakage at the handle can lead to severe injury, and it lessens the knife’s durability in the process. The double bolster design allows for the perfect amount of heft needed to forcibly cut through bones with ease. When holding the handle, you’ll notice that it’s ergonomically designed for a strong grip. At the end of the handle (before the blade) is an extruded safety feature to ensure that your hand never slips off and into the path of the blade. If you’ve ever cut chicken or other meat before, you know how important of a safety feature this is to have. I can’t say that I am a bladesmith and know all of the different blade material available, but I do know that high-carbon stainless steel is one of the better blade types available. German craftsmanship at its finest, I am prepared to use this knife until I’ve sharpened it down to the handle – it’s that good. You’ll immediately notice how the blade’s “give” allows you to slightly pry a bone lose, but it gives just the right amount of bend to ensure durability. A family-owned business for over 200 years, a unique feature of Wusthof blades is that they’re precisely tempered. What this means is that the blade will hold its edge for a very long time before it needs to be sharpened. There is also a compound angle on this blade that is rather uncommon in the industry. The angle begins to taper to allow for a sturdy blade that is very sharp with an equally sharp tip. But, you’ll also have just the right amount of flexibility to create the overall ideal knife for chicken. For me, the quality of this knife from the sharpness of the blade to just the right amount of flex makes this the perfect knife for chicken. And just to be thorough, I want to share with you the right technique to cut raw chicken. 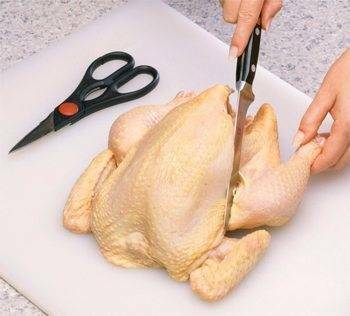 This will allow you to cut your whole chicken like a pro without worrying about dulling the knife or potentially cutting yourself in the process. I cut through whole chickens at least once every two weeks. From stews and soups to chicken for sandwiches, I love to use whole chicken because it’s fresh and cheaper than pre-cut options. And, I find that the taste is much better, too. Use paper towels to pat down the chicken to ensure it’s dry. This will allow for less risk of slippage when cutting. Your meat may be torn slightly where the wing meets the breast. Don’t worry, this is perfectly normal and doesn’t indicate a problem with the chicken. It’s easier to cut the chicken prior to cooking it, but the option is yours. Always use a de-boning knife for the majority of your chicken cuts for the utmost in precision and safety. Sharpen your knife if needed. You need a very sharp knife to proceed. Starting with the wing tips, pull the wing out to the side, making note of the joint. Take your knife and cut right through this joint. Repeat the same process on the opposite wing tip. Hold the thigh of the chicken in the air to allow gravity to help during this step. You want to cut the skin deeply so that you can pull the thigh away from the breast. You’ll notice that the joint of the thigh has been pulled out of place. Cut through the chicken to the side of the joint. The joint will come away perfectly, allowing for a nice thigh cut. Repeat steps 3 – 4 on the opposite thigh. Prepare the cut for the breast by locating the bone in the center of the carcass. Slide your knife down the side of the bone, right past the bone. Making several gentle strokes with the knife, you’ll begin to notice that the breast is coming away from the bone itself. When you find the joint where the wing meets the carcass, you’ll want to cut right through the meat between the carcass and exposed joint. Repeat step 5 on the opposite side. Separate the wings and breast by cutting the meat between the carcass and meat. Turn the legs over and separate the drumsticks from the thigh by locating the joint with your finger. This is where you’ll want to use your knife and cut right through the joint. I’ve listed the knife that has helped me master the art of cutting chicken. Now, it’s your turn to choose this knife or another knife to cut your chicken with. Remember, if you’re having difficulty cutting through a whole chicken, you’re using the wrong knife for the job. 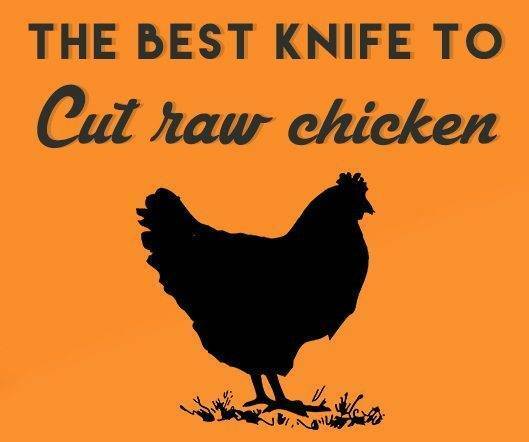 » Kitchen Knives » What’s The Best Knife to Cut Raw Chicken?